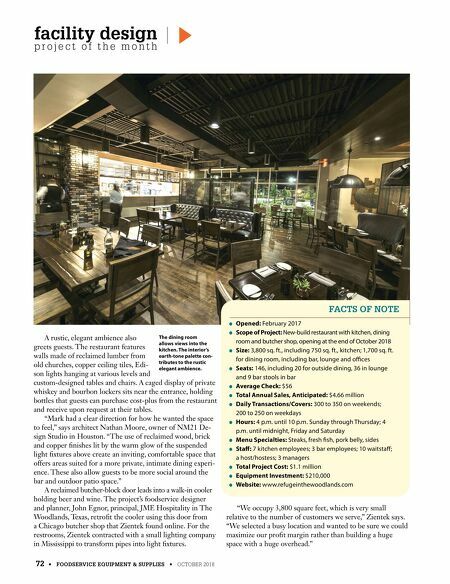 72 • FOODSERVICE EQUIPMENT & SUPPLIES • OCTOBER 2018 facility design p r o j e c t o f t h e m o n t h A rustic, elegant ambience also greets guests. The restaurant features walls made of reclaimed lumber from old churches, copper ceiling tiles, Edi- son lights hanging at various levels and custom-designed tables and chairs. 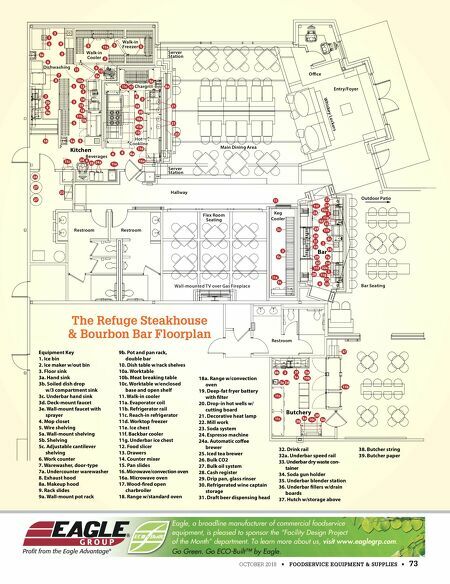 A caged display of private whiskey and bourbon lockers sits near the entrance, holding bottles that guests can purchase cost-plus from the restaurant and receive upon request at their tables. "Mark had a clear direction for how he wanted the space to feel," says architect Nathan Moore, owner of NM21 De- sign Studio in Houston. "The use of reclaimed wood, brick and copper finishes lit by the warm glow of the suspended light fixtures above create an inviting, comfortable space that offers areas suited for a more private, intimate dining experi- ence. These also allow guests to be more social around the bar and outdoor patio space." A reclaimed butcher-block door leads into a walk-in cooler holding beer and wine. The project's foodservice designer and planner, John Egnor, principal, JME Hospitality in The Woodlands, Texas, retrofit the cooler using this door from a Chicago butcher shop that Zientek found online. For the restrooms, Zientek contracted with a small lighting company in Mississippi to transform pipes into light fixtures. "We occupy 3,800 square feet, which is very small relative to the number of customers we serve," Zientek says. "We selected a busy location and wanted to be sure we could maximize our profit margin rather than building a huge space with a huge overhead." ● Opened: February 2017 ● Scope of Project: New-build restaurant with kitchen, dining room and butcher shop, opening at the end of October 2018 ● Size: 3,800 sq. ft., including 750 sq. ft., kitchen; 1,700 sq. ft. for dining room, including bar, lounge and offices ● Seats: 146, including 20 for outside dining, 36 in lounge and 9 bar stools in bar ● Average Check: $56 ● Total Annual Sales, Anticipated: $4.66 million ● Daily Transactions/Covers: 300 to 350 on weekends; 200 to 250 on weekdays ● Hours: 4 p.m. until 10 p.m. Sunday through Thursday; 4 p.m. until midnight, Friday and Saturday ● Menu Specialties: Steaks, fresh fish, pork belly, sides ● Staff: 7 kitchen employees; 3 bar employees; 10 waitstaff; a host/hostess; 3 managers ● Total Project Cost: $1.1 million ● Equipment Investment: $210,000 ● Website: www.refugeinthewoodlands.com FACTS OF NOTE The dining room allows views into the kitchen. The interior's earth-tone palette con- tributes to the rustic elegant ambience.